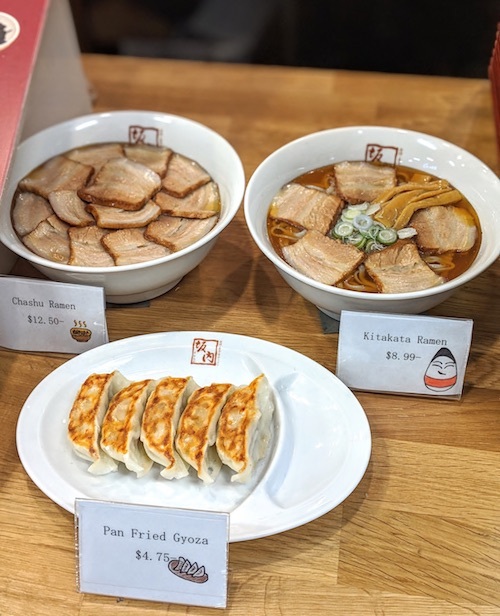 When talking about "Big 3" regional styles of ramen, most people outside of Japan have heard of Hakata and Sapporo styles, both having evolved from large metropolitan areas with many vendors and varieties. But a third lesser known style was developed in northern Honshu in the small village of Kitakata which gives it its name. Known for its storehouses full of soy sauce, Kitakata-style ramen uses this as its base, a type of shoyu. 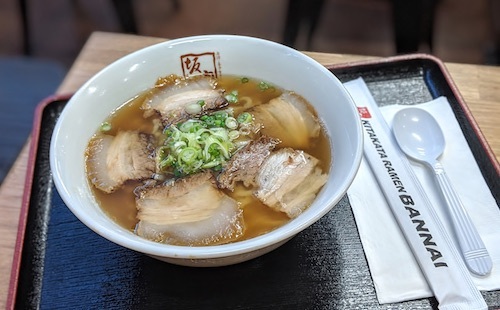 The bowl itself appears simple, a broth full of noodles and topped with chashu and some thinly sliced spring onion, but do not let this fool you. This broth has been extracting pure umami from pork bones for "long hours" which gives it an almost smoky and toasted taste, full of earth and charcoal. Ban Nai is the most famous source of this style of ramen, with 62 locations around Japan. 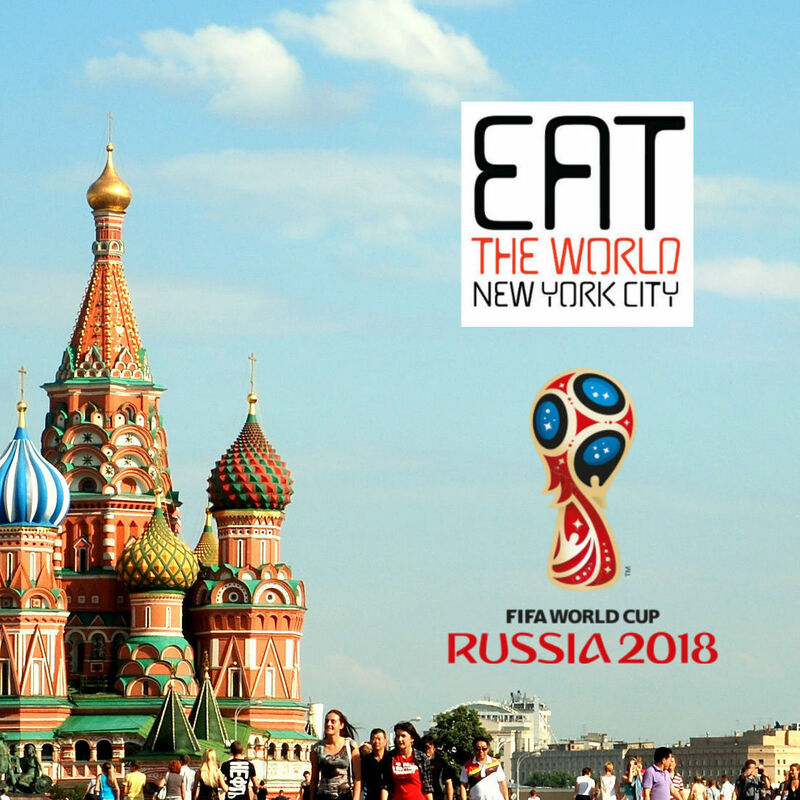 Here in the United States there are now two in Orange County, California, one outside of Chicago, and now one tucked into a grocery store in Jersey City. The broth of their standard Kitakata ramen ($8.99, above and below) is already full of flavor, but the chashu is a flavor bomb. Some might call this salty but their "secret recipe" marinade is wonderful, the pork belly is definitely its own product and not just full of taste from the bowl. For an upcharge to $12.50 you can get a bowl completely covered at the top with chashu (see plastic model below). 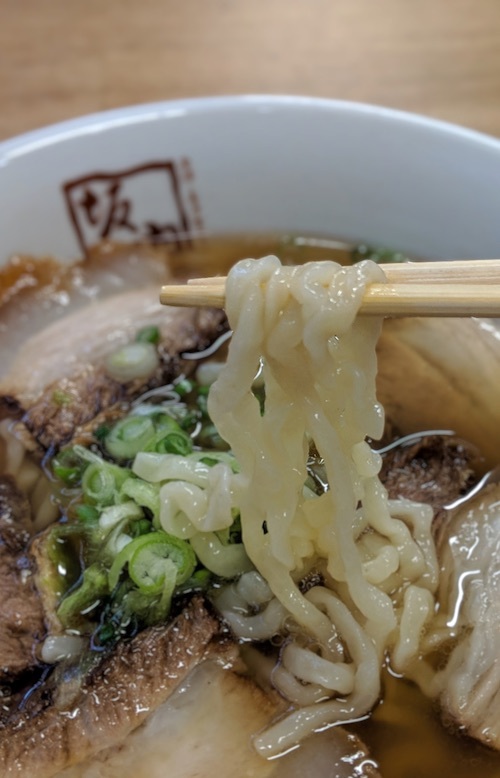 The noodles of Kitakata ramen are thick, curly, and chewy as seen above. More water than usual is used in these to give it the soft texture and they are hand-crumpled for the waviness. This character seems to be perfect for the interaction it has with the broth. Plastic models (shokuhin sampuru) of all the three most popular items. Inside of the 99 Ranch Market, a clean and not so busy grocery store which itself is within the Old Colony Square, there are also a few stalls selling Chinese food, both a la carte and buffet style. You can get self-serve dim sum, bubble tea, and sweet cakes from other vendors.